In all patients with eyelid injuries, exclude underlying globe injury, canalicular laceration, and foreign body. During surgical repair of lid lacerations, ensure that no knots or suture material can damage the cornea. Penetrating lid trauma with extensive periorbital ecchymosis. A ringlike projectile was ejected from a pipe fitting under high pressure. The patient also experienced choroidal rupture and traumatic optic neuropathy. Eyelid lacerations may (1) involve the lid margin, requiring a meticulous suture technique; (2) be extramarginal; or (3) cause tissue loss. Extramarginal upper lid laceration from blunt trauma in an infant. Such lacerations tend to follow relaxed skin tension lines. 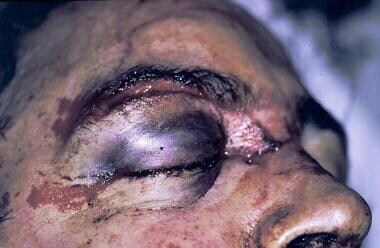 The visual prognosis for lid lacerations is usually excellent unless there is accompanying globe rupture. With proper reconstruction of lid lacerations, the cosmetic result is usually quite good. Lid notching, cutaneous scars, and cicatricial ectropion may require revision surgery. Ing E, Ing T, Emara B. Ocular adnexal injuries from industrial blunt hook trauma. Can J Ophthalmol. 2002 Apr. 37(3):177-8. [Medline]. Timoney PJ, Stansfield B, Whitehead R, Lee HB, Nunery WR. Eyelid Lacerations Secondary to Caesarean Section Delivery. Ophthal Plast Reconstr Surg. Nov 2011. [Medline]. Tabatabaei A, Kasaei A, Nikdel M, Shoar S, Esmaeili S, Mafi M, et al. Clinical characteristics and causality of eye lid laceration in iran. Oman Med J. 2013 Mar. 28 (2):97-101. [Medline]. Green BF, Kraft SP, Carter KD, et al. Intraorbital wood. Detection by magnetic resonance imaging. Ophthalmology. 1990 May. 97(5):608-11. [Medline]. Balaggan KS, Goolamali SI. Periorbital necrotising fasciitis after minor trauma. Graefes Arch Clin Exp Ophthalmol. 2006 Feb. 244(2):268-70. [Medline]. Yakoubi S, Knani L, Touzani F, Ben Rayana N, Krifa F, Mahjoub H. [Eyelid necrosis after injection of lidocaine with epinephrine]. J Fr Ophtalmol. 2012 Feb. 35(2):113-6. [Medline]. Stevenson TR, Thacker JG, Rodeheaver GT, et al. Cleansing the traumatic wound by high pressure syringe irrigation. JACEP. 1976 Jan. 5(1):17-21. [Medline]. Cho SH, Hyun DW, Kang HJ, Ha MS. A simple new method for identifying the proximal cut end in lower canalicular laceration. 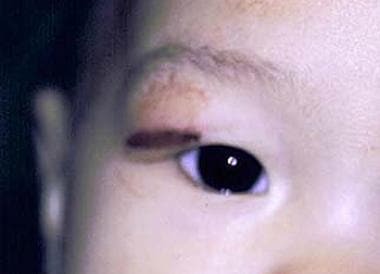 Korean J Ophthalmol. 2008 Jun. 22(2):73-6. [Medline]. [Full Text]. Jordan DR, Gilberg S, Mawn LA. The round-tipped, eyed pigtail probe for canalicular intubation: a review of 228 patients. Ophthal Plast Reconstr Surg. 2008. 24:176-80. Tint NL, Alexander P, Cook AE, Leatherbarrow B. Eyelid avulsion repair with bi-canalicular silicone stenting without medial canthal tendon reconstruction. Br J Ophthalmol. 2011 Oct. 95 (10):1389-92. [Medline]. Priel A, Leelapatranurak K, Oh SR, Korn BS, Kikkawa DO. Medial canthal degloving injuries: the triad of telecanthus, ptosis, and lacrimal trauma. Plast Reconstr Surg. 2011 Oct. 128(4):300e-305e. [Medline]. Perry JD, Aguilar CL, Kuchtey R. Modified vertical mattress technique for eyelid margin repair. Dermatol Surg. 2004 Dec. 30(12 Pt 2):1580-2. [Medline]. Gonnering RS, Kindwall EP, Goldmann RW. Adjunct hyperbaric oxygen therapy in periorbital reconstruction. Arch Ophthalmol. 1986 Mar. 104(3):439-43. [Medline]. Dagum AB, Antonyshyn O, Hearn T. Medial canthopexy: an experimental and biomechanical study. Ann Plast Surg. 1995 Sep. 35(3):262-5. [Medline]. Preoperative. This child had a dog bite injury with a double lower lid margin laceration, dehiscence of the lateral canthal tendon, and disruption of the inferior canaliculus. Postoperative. The inferior canaliculus was repaired with bicanalicular stenting. Lateral canthus reattachment and repair of lid margin lacerations was performed.